How do all the components of a cloud provider model fit together from an architectural perspective? The following diagram depicts the various cloud services and how they relate to each other based on the three constituents: cloud consumers, cloud service providers, and cloud brokers. This diagram is from the National Institute of Standards and Technology. The National Institute of Standards and Technology cloud architecture. On the left side of the diagram, the cloud service consumer includes all those consumers bringing a group of services together for internal and external users; and the business management that needs to have these services available as part of business strategy implementation. Within this category are the applications, middleware, infrastructure, and services that are built based on on-premises computing models. In addition, this model depicts the role of the cloud auditor. This organization provides the oversight either by an internal or an external group that makes sure that the consumer group meets its obligations. 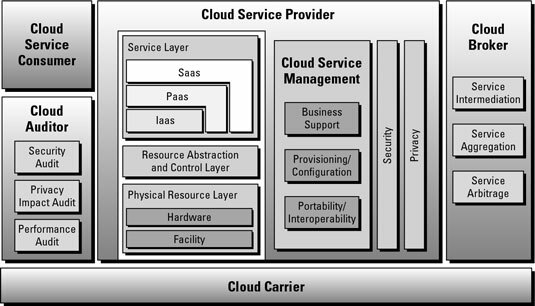 Cloud service providers (see the center of the diagram) represent all the models of cloud services. A cloud service provider might be a commercial company or a corporation that decides to become its own cloud service operator. Cloud providers may provide the underlying physical and virtualized resources needed to run various cloud services. They also may create the actual applications and business services that operate in these environments. These various cloud models don’t exist in isolation — they’re all related to each other. In addition, there’s an entire ecosystem of partners that support various vendors with offerings. The cloud service provider provides a unified architecture to support and manage these services consistently. Managing these services is a major requirement for any cloud service provider. These management platforms have to both provide support for the operation of the various services and manage the way they perform to support business requirements. The cloud provider has to support all of the important cloud delivery models, including Business Process as a Service (BPaaS), which isn’t depicted in the diagram. In addition to supporting the physical and virtual environment, it is important to remember that all of these cloud models and the supporting environment have to be linked together in the form of service orchestration. Without service orchestration, each service would become an independent silo. Clearly, all the components in the cloud provider model must be managed. There have to be services to support the business, to manage configurations, and to provision the right resources on demand. Management services must also support interoperability and service portability.